You can call him Scotty. Lt. Commander Montgomery Scott, Chief Engineer for the starship Enterprise! 11 3/4-inch tall action figure based on Star Trek: The Original Series. Features an uncanny likeness of actor James Doohan. Boasts 30+ points of articulation, fabric clothing, multiple hands, and a wealth of accessories! Known as Scotty, Lt. Commander Montgomery Scott was Chief Engineer for the starship Enterprise. He now joins the ranks of Quantum Mechanix's Master Series as this stellar Star Trek: The Original Series Lt. Commander Montgomery Scott 1:6 Scale Action Figure. He features more than 30 points of articulation, iconic accessories like his phasers, and multiple hands to create the perfect poses for your collection. 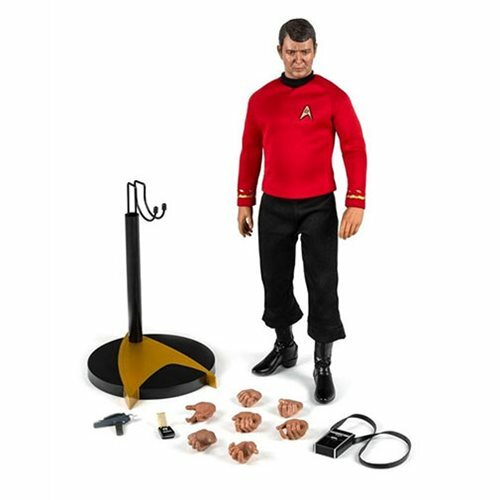 As with the previously released Star Trek: The Original Series Master Series figures (sold separately), each head sculpt is faithfully rendered for an uncanny likeness of actor James Doohan and specially hand painted by top artists in the field. The included wealth of accessories and fabric outfit have been meticulously researched down to the last stich or phaser grip. The figure measures about 11 3/4-inches tall and comes packaged in a closed box. Beam him up! A little-known fact is that actor James Doohan served in the Canadian military during WWII and lost a finger off his right hand. Although his character did not have a missing a finger, Quantum Mechanix has included one hand missing a digit to pay homage to the beloved actor.